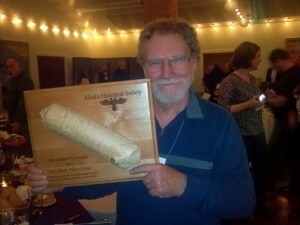 Mike Hawfield receives the President’s Award at the 2013 annual meeting, Haines, Alaska. Photo by Jo Antonson. The President’s Award/Beaver Log is given by the Society’s president for outstanding contributions to the society. This award is not given every year.